Two story brick home on an acre along the beautiful Guadalupe River. Located near downtown Seguin, minutes to shopping, a 15 minute drive to New Braunfels and only a 35 minute drive to downtown San Antonio to the Alamo & Riverwalk. Flat screen TVs in every room. Wireless Internet. A large patio outside for backyard bar-b-q's Note: The picture of the swimming pool is at a public park a mile away, however there is great swimming at the river at this property. The river is at the edge of the fenced backyard, with a dock for easy boating, swimming, or fishing. 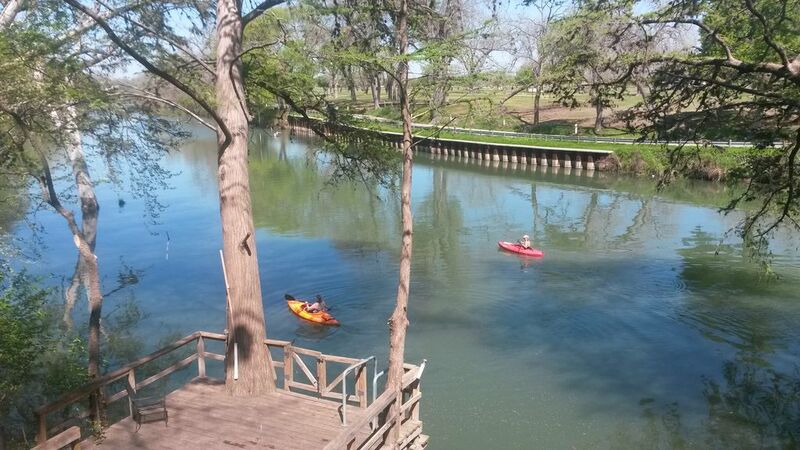 Our family really enjoyed our stay at this river front property in Seguin, TX. There were plenty of beds to accommodate our large group. There was enough room to meet all of our needs. This house was perfect for our group of 5 adults and 10 kids. It's not fancy, but is everything a river house should be - cozy and functional. The kids loved playing basketball out front and hanging out around the fire pit in the backyard. We hope to return again in the spring or summer when it warms up and we can actually get in the river! 20 members of our family flew or drove in from 4 different states to meet up for Christmas. We spent 7 days together - 10 adults and 10 children, all in the house and had a wonderful time. There was plenty of space and plenty of sleeping room. The kitchen was fully stocked with all kinds of kitchen utensils including cork screws, lemon squeezer, crockpot, hand mixer, cooking sheets, etc. The back porch was very large and open, great for any rainy days. There was room for us to set up a projector screen (our own projector) and watch football or put movies on for the kids. We even had a game of corn hole going as well as board games, all on the back porch. There are two siting rooms and two spaces for eating plus another large table on porch. The yard was huge, the grill worked great, the fire pit was awesome, and there was a huge pile of supplied fire wood. Plenty for the indoor fireplace as well. We loved being on the river and even went for a Christmas Day rope swing plunge into the Guadalupe. Nice dock for fishing and kayaks and tubes provided as well. The fence is secure and we felt very safe with our young children in the back yard. (Pack a padlock for river gate though, if needed.) There is also a huge park a few miles away and an H-E-B. We had a great time and would definitely revisit! My social org had our fall retreat at this house and it was absolutely perfect for our small group. The house was fully stocked with everything we might need, plenty of firewood for the fire pit, and a beautiful view of the river. We plan on coming back every semester for our retreat. What a great experience! We stayed for 3 days and had 19 people attend for a Nurse retreat. The house was large enough to handle our entire party with extra space to fit more if we needed it. The property owner was very accommodating, attentive, and reachable for any questions we had leading up to the trip and during our stay. The backyard is amazing! Grilling, s’mores and singing by the fire, floating, kayaking, and swimming the river all conveniently located in the backyard! The water was perfect! If you are planning a river trip this is the perfect house to stay in! Oh my gosh! We were all so ready for this week, but were not expecting such great accommodations! It was great! My husband & I take the grandkids to Schlitterbahn for a couple of days. We've been staying at rental properties for the past couple of years. Imagine our surprise when the kids were satisfied with just one day at Schlitterbahn. They loved swinging off the rope & splashing into the river. They also really enjoyed the kayaks & tubing that were provided by Mr Hollingworth. The volleyball sandlot was a great family get together as well. The kitchen had everything we needed to cook our big meals. Mr Hollingworth was such a great help. He was always a phone call away. We will definitely be back. Thanks again Mr Hollingworth for sharing your great place with us. Just kicking back and relaxing, enjoy a spacious back yard and patio with the Guadalupe flowing just a rocks throw away. BBQ, Play horseshoes or volleyball, fish or just hang out on the couch and watch espn.